When was the last time you talked about your faith or Jesus with someone who is not Christian or a practicing Christian? A few years ago, our family traveled to Lee’s Summit, Missouri to celebrate the 100th birthday of my wife’s mother, Mary Louise. We had a wonderful celebration, with all of her children, some grand children and great grandchildren being present to honor her life. From teaching eight grades in a one room country school in the 1930’s to taking care of elderly parents and other relatives until she herself was 82, her life was a witness to a deep faith in God filled with love and service to others. Although her life in recent years was confined to an assisted living home where she and about 40 other residents lived, she had not forgotten the words of Jesus in the Great Commission in terms of reaching out to people and inviting them to church. In the course of our many conversations she mentioned that she had invited her friends Millie and Dodie to start attending church services that were held every Sunday at the home. “Dodie had not been to church in 50 years,” she said. “And Millie had not been for a long time either, but I got them going with me each week now.” “I try to help them understand what the Bible says and means when I get the chance,” she added. In Isaiah 49:6, the prophet says, “I will make you a light to the gentiles that you may bring my salvation to the ends of the earth.” At age 100, Mary Louise was still being a light to the people God put in her life. She was still being faithful to God’s plan of working through us to be his presence and to bring his presence to the people and circumstances of our lives. At 103, Mary Louise was welcomed into the arms of Jesus. She never stopped sharing her faith. Are you talking about Jesus with the people in your life, or inviting them to church, a Christian event or other opportunity where they can meet Jesus and his Word? This entry was posted in Evangelization and tagged The Great Commission on June 30, 2015 by Bill Dalgetty. Do you experience Christian community with people who have an extra measure of compassion, love, acceptance and understanding? This is what my wife and I experience with the families of the friends of our daughter Emily who was born with Down syndrome. Emily was blessed to attend Paul VI Catholic High School in the Arlington, VA diocese with its special program for children with developmental disabilities. Last Saturday we celebrated the 10th graduation anniversary for Emily and her friends along with their families at a backyard cookout. Almost fifty people including Emily’s friends, their parents and a couple of former teachers joined in the celebration with games, food, drink and conversation. What distinguished this gathering was the nature of the people. Emily and her friends, now all young adults, have an inclination to love with absolutely no guile and a purity of heart that has impacted all of us. As a result, parents seem to have an extra measure of compassion, love, and acceptance, along with a focused determination to be an advocate for the needs of their children. Over the years, most of them have had to advocate for their children with geneticists, doctors, surgeons, therapists, teachers, school administrators, counselors, job coaches and employers. They know what tough love is. My wife and I have experienced Christian community with our church, a parish prayer group and a covenant charismatic community. They have all been a blessing in our lives, but Emily’s friends and their families have a special place in our hearts. The folk hymn, They Will Know that We Are Christians by Our Love seems quite appropriate here. If you have never been acquainted with a special needs child, seek out the opportunity. You will see the face of God in their big smiles and innocent hearts. This entry was posted in Special Needs Children and tagged A Special Christian Community on June 23, 2015 by Bill Dalgetty. Do We Value the Holy Spirit? According to St. Paul, when we receive the Holy Spirit we can know the mind of Christ. “No eye has seen, no ear has heard, no mind has conceived what God has for those who love him, but God has revealed it to us by the Holy Spirit.” (1 Cor. 2:9-10) He goes on to say that no one knows the thoughts of God except the Spirit of God. In the Holy Spirit, we may understand what God has freely given us – words taught not by human wisdom, but by the Spirit, expressing spiritual truths in spiritual words. The Holy Spirit gives me a sense of belonging to God – a feeling of security, knowing that the God of all creation is my Father. He is not distant and out of reach. He has made himself available to me by becoming one of us through his son, Jesus, the Messiah. I can see how much he loves me by how he sacrificed his life through the tortuous death of Roman crucifixion. His Spirit gives me the desire to overcome my selfish nature, and love and serve my wife, family and others as much as I am inclined to serve myself. 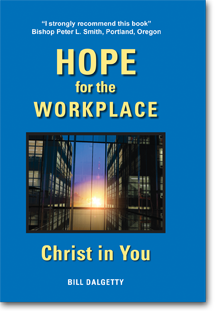 The Holy Spirit helps me to understand that I am to be a good steward of the people and circumstances in my life, including family, work associates and friends. He has taught me to have courage and trust when faced with the life threatening illness of cancer, a family challenge of a disabled child or circumstances that threaten a career path. How remarkable! Who can equal God’s love for us and the gift of the Holy Spirit which is our enabler in love, wisdom and truth? I once heard that the contrast between living life in the fullness of the Holy Spirit and not doing so is similar to the difference between lightning and a lightning bug. Jesus said, “How much more will your Father in heaven give the Holy Spirit to those who ask him? You may believe in God the Father and God the Son, but are you experiencing their personal presence through the gift of the Holy Spirit? This entry was posted in Christian Renewal and tagged Valuing the Holly Spirit on June 16, 2015 by Bill Dalgetty. When was the last time you listened closely to the words of the Lord’s Prayer? On Sunday mornings once a month, I take communion to Catholic residents at a nearby nursing home, including a few residents in various stages of Alzheimer’s. Some of the Alzheimer residents are not able to receive communion, or are often asleep when I arrive, so I usually just say a short prayer with them. Last Sunday, when I came to one of the women who had her eyes closed (let’s call her Alice for the sake of privacy), I gently touched her on the shoulder and asked her if she would like to say the Lord’s Prayer. She opened her eyes in kind of blank stare. I knelt down beside her, put my hand on her hand, and started to slowly recite the Lord’s Prayer. Her eyes began to open wide and she started to say the words with me. Her eyes became wider and wider as she saw herself remembering the words. A slight smile spread across her face. She appeared as if she were proud of herself for remembering the words. As we finished a small tear appeared in the corner of one of her eyes. I said, “Alice, would you like to receive communion?” “Yes,” she nodded, and I placed the Eucharist on her tongue. This was the first time that I had ever seen Alice receive communion. It was as if the Lord’s Prayer had awakened her soul and memory, enabling her to recite the entire prayer. It made the back of my neck tingle. I, too, was impacted by seeing the power of Jesus’ words on Alice, words Jesus suggested to his disciples when they asked him how to pray. (Luke 11:2) For many of us the Lord’s Prayer has become so familiar we may recite the words, but their meaning may no longer penetrate our mind and heart. I must confess that I was impacted in one additional way. When I first started to take communion to the residents of this nursing home, I was very uncomfortable with the Alzheimer’s residents. In fact, on my second visit I skipped going to their floor. But after seeing the impact of Jesus’ words on Alice and watching how those words awakened God’s presence in her, I received a new love for Alice and all her fellow residents. God was moving in my heart as well as Alice’s. I will never skip her floor again. Do you have a perspective on a person or situation in your life that God would like to change? This entry was posted in Christian life and tagged Lord's Prayer Awakens a Soul on June 9, 2015 by Bill Dalgetty. 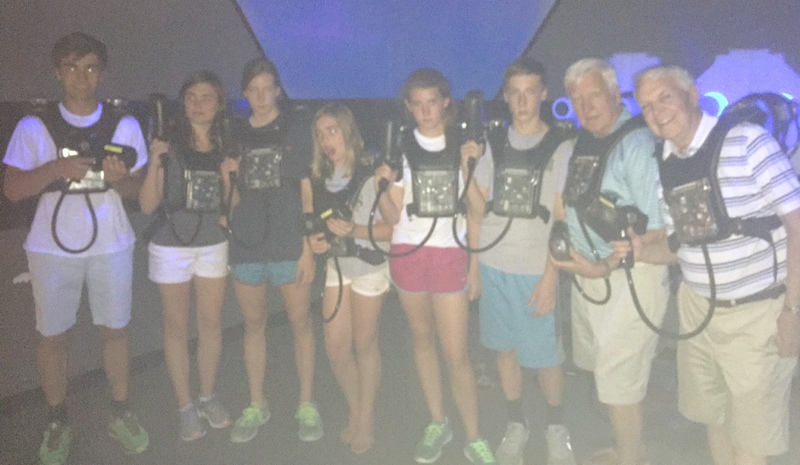 Can God’s design for the family include laser tag? Story: This past weekend, we were visiting two of our children’s families to attend the high school graduation of our oldest grandson. Following a post-graduation party and dinner, we were sitting around visiting with the two families, including our grandson’s paternal grandparents, when his siblings and cousins came up with the idea that the two grandfathers, should take the six of them to play laser tag at a local game arcade. Not only were we to take them, we were to join them in the game. So here we were, two white haired septuagenarians and six teenagers, ages 12 to 18, driving in an eight passenger van to a local laser tag arcade. For those who have never had the experience, laser tag is a game where you put on a vest with four electronic targets located on the chest, back and both shoulders, along with a hand-held infrared laser gun. You are put in a low light room with two levels and various structures to run around and hide behind while aiming your laser gun at another person’s target areas. A hit on another person gives you 100 points and a hit on you subtracts 50 points and disables your gun for three seconds. The person with the most points wins. Both the kids and the white haired old guys had a blast! The old guys were quite proud of themselves and will long cherish the memory. Hopefully the young folks, separated by two generations, will as well. Reflection: God created us in his image, male and female. He said, “Be fruitful and increase in number; fill the earth and subdue it. He put us in the garden of his creation “to work it and take care of it.” (Genesis 1:27-28, 2:15) The family is the natural result of this creation and all that follows. God calls us to carry forward his design from generation to generation. This is a blessed calling, ordained by the one who created all that exists. It is filled with challenges and sacrifice, but can be balanced with deep love and unforgettable blessings. In this case, there was love in the request from the one generation, and there was love in the acceptance of the request by the generation once removed. Upon arriving back at the house there was joy among all three generations by what had taken place. What was the source of this joy? God’s design for his creation was being lived out through three generations of family, ironically and humorously highlighted through a mundane game of laser tag. Do you see God’s hand in the ordinary circumstances of your family? This entry was posted in Christian life and tagged God's Design for the Family on June 2, 2015 by Bill Dalgetty.